This is a lively and humorous picture book about a boy who receives an unusual prize; to run the zoo for a day! A challenging task in itself but even more so because this is a zoo for monsters! The rhyming and rhythmic text makes this a great story for reading aloud and joining in and there is plenty to talk about in the funny illustrations. 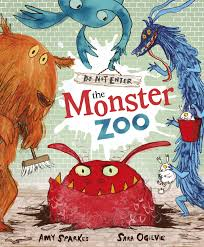 Do Not Enter the Monster Zoo was shortlisted for Roald Dahl funny prize 2013 and for Booktrust best book awards 2014. The way the text is designed suggests how to read it aloud with some words in bold to emphasise loudly and some like ‘t-i-p-t-o-e-d’ to whisper. As you re read the story children can join in too, for example by completing the rhyming sentences eg ‘The naughty creatures stole my hat. My broom became their cricket ………! Look at some of the pages closely eg where the monsters are making a mess in the zoo and talk about what they are doing. Make a potato print picture of monsters footprints like the end papers in the book. You will need a few potatoes, cut into suitable shapes, paint and large sheets of paper (wall paper lining paper is useful for this). Write a list of all the jobs which need to be completed at the Monster Zoo. Click here for a special Zoo Keeper job sheet. Fold a piece of A4 paper in half and then half again to make four sections so that your child can make a leaflet with a mini guide to the creatures in the monster zoo, drawing a different monster in each section. They can have a go at writing the names of the different monsters as well. Using plasticine children can make models of the monsters in the zoo. They could arrange their figures on a large piece of card or in a cardboard box decorated and divided into sections to represent the zoo and its enclosures. They could retell some of the story with their model. A small plastic figure could be the boy. Gruff’s Guide to the Secret SeaVisit a real zoo. Search for zoos and wildlife sanctuaries near your home here.